Decoration on Diwali is one very important errand to do on time because honestly, Diwali is all about decorations. All we have in our minds is ” what unique can we do this Diwali at our homes?” This article might just help you with this query. The phrase ” Cleanliness is next to Godliness” goes appropriately with this festival! Cleaning up the house is the foremost thing to do. The bottom line is that the pre-Diwali decorations and arrangements leave us with less time. 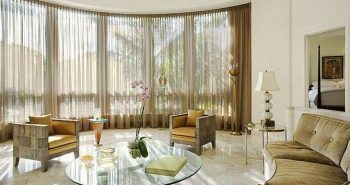 Everything would go great and perfect if you knew exactly how to go about decorating your home this Diwali! The history of Rangoli is quite ancient. This technique of decoration is very much common in the Southern India. Making Rangoli at home during Diwali gives a very personalized touch to the decorations at your place. You can create multiple rangolis. Organic colors, colored sawdust or natural colored ingredients can be used too. 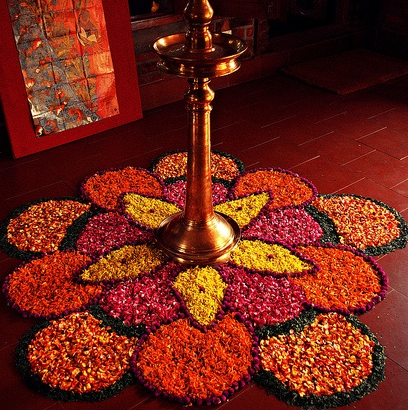 Flowers can be used too as they will add a very fresh and pretty look to your rangoli. Finding the right design for your rangoli is not a problem. You can refer to the internet or buy a Rangoli design book. The trick is to draw the design using a pencil or a colored paint before filling in the colors. This will help you make your rangoli neater. Stencils can be used to for the same but I would always suggest that design something without the stencil giving it a personal touch. Rangoli will help you beautify the entrance of your home. 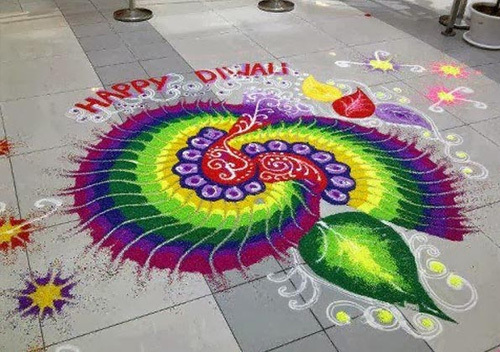 Another hack is the usage of palm leaves in order to add a special effect to your rangoli. 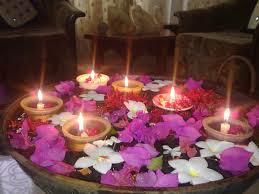 Light candles or diyas around in order to give it a natural glow at night. Flowers can add life to anything. Decoration using flowers can never go wrong. The worship place at your home can also be decorated using flowers. Flowers add to the natural fragrance which gives a very pleasing effect. Another thing which you could do is place dried flower leaves in a bowl for decoration. You could also put fresh flower petals in a glass bowl filled with water and a floating candle. This would look just great! Flowers can be used to decorate the entrance of your home or even the staircase. According to the Hindu tradition, Diwali is a very pure festival and it includes the worship of Lord Ganesha and Goddess Lakshmi. Flowers can be used to decorate your worship place in a very beautiful way. The most important flower is “lotus” on this festival as goddess Lakshmi resides on it. There are actually many ways to play with flowers in order to decorate the house. Tree leaves are equally good to go for any kind of decoration. You could decorate a set of leaves with the same size but different shapes and tie them together for a toran. As mentioned earlier about the extensive use of Palm leaves in the decoration of a rangoli. They can be used in order to place a diya. Not only this, palm leaves are needed in the rituals performed on Diwali so you will need it anyway at your worship place. You could also make a leaf picture of ‘Ganesha’ by just using the leaves! You could also decorate the entrance of the house, or the main gate with a string of folded leaves, placed alternatively with a string of flowers to add a great effect! Diyas are of many types, broadly categorized as the ones made of aluminum and the ones made by wet sand. The best part about diyas is that they add a whole different look to the house. You can decorate diyas all by yourself or buy the pre-designed diyas. You will need some near your worship place too as Diwali is like incomplete without diyas. Use decorative stuff or glitters or simply just paint the diyas to give a more colorful look. Floating candles are like the little touch up that we do to our decoration which adds on to the entire beauty of the place. You could place these little fragrant candles in a glass bowl in the living room and add rose petals to that bowl to enhance its beauty. 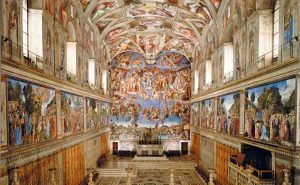 Light them up with a little dim light in the room and see the magic of this ‘decoration’. Diwali lights are the backbone of the entire decoration you do at your home. They brighten everything and add a glow to the entire decoration. Simple LEDs are used to decorate the house. You could also use such LEDs inside your house to decorate your room or any other place. 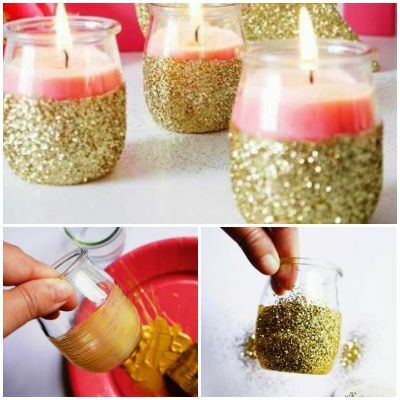 Candles can be used in various ways. We could either use a simple candle or a candle which is pre-decorated. We also have the option of decorating these candles. You can team up candles with diyas to give a great effect. The Oriental style of paper lanterns is delicate, exotic yet beautiful. Gujrati lanterns are very famous. You can even make a paper lantern if you wish to decorate your verandah or entrance using it. Dupattas can decorate a place beautifully. They could be molded into any shape in order to decorate. You could probably make a diya using various dupattas and hang it on a wall and light it with LEDs. To enhance the effect, you could use ‘bandhani’ dupattas. Torans add to the traditional touch to your house’ decoration. You could either buy a toran or make one at home. You could hang one at the entrance itself to enhance the festive look. By mentioning ‘handmade’, I don’t really mean that you sit and make everything. Nowadays, there are many stalls which offer handmade stuff like cushion covers, coasters, mats etc. You could get your hands on them and use them during the festive season. They add up to the color as they are bright and colorful. Well if you want to save time or in case you aren’t left with much time for the decoration, then simply buy some 3D decorative stuff to put around so as to give the house a festive look. You could go for small sculptures of Lord Ganesha and Goddess Lakshmi and place them in your living room. This will give a positive vibe too. Read more about Diwali here.